Madina town college Faisalabad admission 2019 open now for all the programs of undergraduate, post-graduate, Mphil and PhD. 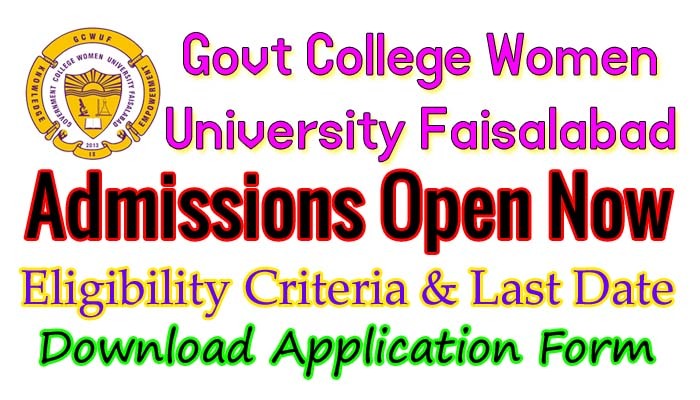 Here at webstudy.pk there is all the information that you need to know about Govt College Women University Faisalabad Admission 2019 like GCWUF Admission 2019 Last Date, Eligibility criteria, Advertisement, Merit List & Entry test result answer keys. Government College Women University Faisalabad undergraduate admission 2019 last date is mentioned on the advertisement given below. GCWUF offers admission in BS, BSc, MSc, MBA, BBA, MS & phD programs every year twice because there is semester system in this institute. All intermediate students who wishes to get admission in this institute do hard work in inter to get flying marks as this is well reputed institute in Faisalabad so students likes to get studied here, GC Women university fsd grant admission 100% on merit. All the parents of students also worried about their future that they child should get admission in well reputed institute or university. Government college women university Faisalabad is one of them and parents also prefer students to study there. If you are going to apply for admission in GCWUF Faisalabad then you should read all this article because here in this post webstudy.pk tells you with procedure to get admission, eligibility criteria and GCWUF fee strucuture 2019. Applicant must have done intermediate with 45% minimum marks and age limit is 22 Years old. An Aptitude test will be conduct for applicants of BA fine arts and BS physical education as this is compulsory..
All the candidates who are applying for MA/M.Sc programs should have score minimum 45% in previous education certificate and 45% minimum in major subjects. Age limit for admission in MA, MSC is 26 years old. An Aptitude test is compulsory for MA English. Applicant must have done MA, MSc or BS 4 Years degree with 2.5 CGPA or 50% minimum marks to get admission in MS or Mphil programs. Candidates having CGPA of 3.00 out of 4.00 or 1st division in MS, Mphil from HEC recognized institute are eligible to get admission in PhD programs. There are a lot of candidate applying for admission in GCWUF so apply as soon as possible. First you have to register yourself online and then put all your personal information and get a print out of your admission form. Submit your admission processing fee into the bank that is separate for each program. Attach all the required documents along with bank challan copy and submit application form to the admission office or post it. Note that all this information about GCWUF Admission 2019 is collected from different online sources but for authentic news & updates of Govt College Women University Spring Admission 2019 Visit Official website. Webstudy.pk is right place for students to get information about all universities admission, fee structure & merit list details. You can download guess papers, model papers & past papers of each class and subject.